I've really been feeling a desire to read more Christian fiction lately, and I haven't been disappointed in the ones that I've chosen to read. The Captain's Daughter was no exception. This book has so many aspects that I love: Victorian England, morals and a message, plus a love story. Yet The Captain's Daughter was a good bit different than I expected it to be. Yes it takes place in Victorian England, but the majority of the plot takes place in the theater which isn't a setting that I often read about from this time period. At first I wasn't sold, but as the story went on, I became more and more interested in how the theater played into the plot. Yes this story has morals and a message, but this book shows the darker side of London's city life as well as some shady characters that aren't shy about branching out from the cultural norms to satisfy their personal desires. Yes this story has a love story, and well...I guess there's not really a but for that piece, and I wouldn't have it any other way. Rosalyn was easy to like. She grew up with her sisters in an orphanage, but again where you'd think "oh no, not an orphanage, that must have been a horrible experience." Surely the loss of her parents was the horrible experience. The orphanage, however, was a blessing. Rosalyn went into a service position at the age of seventeen unlike most novels from this time period I've read that feature ladies that come from "a good name." Her journey to London ending up as a dresser for a theater company was filled with one misfortune after another. As I mentioned earlier, The Captain's Daughter doesn't shy away from the dark places and people, and Rosalyn seems to run into just about every kind of person who would take advantage of her. And Rosalyn is quite naive, however, she manages to navigate these situations even if there were times I thought she could have opened her eyes a little more. Nate is honorable in just about every way. He's exactly what you would hope to find in a good man. He was in the army for seven years, and due to a hand injury is now only in the reserves. Yet he intends to return to service in hopes to atone for a mistake he made. He hasn't shared the whole story with any of his family so no one really understand his desire to return. In the meantime, Nate is working two jobs. He works at the stables during the day, but then he's temporarily working his brother's job as a stagehand for the theater so that Patrick doesn't lose his position while he heals from a broken leg. And it isn't just Nate. His whole family is noble. They seek to help others as often as they can. They have a few boarders living in their home. Nate does work for the parsonage and his mother and sisters work with a ladies' home. I appreciated that the Christian aspects felt genuine and not forced at all. The Captain's Daughter might have had some shady characters, but there were plenty of heartfelt characters just trying to do the right thing. I loved the mix. And I always appreciate a story that uses Christ as a moral compass without feeling like it is preaching to the reader. -"Don't be so quick to give up what God has clearly provided." -"Grab onto the opportunities that open to you." -How ironic that he could wish for her to be happy and yet be so pained to see it. -"But that still doesn't absolve me for what happened." "Perhaps not. But then, absolution doesn't come through what we can do, does it? It comes from another source. One greater than ourselves." The Captain's Daughter was a great choice for me considering I've been in a bit of a reading slump. It pulled me in quickly, but beyond that, I didn't want to put The Captain's Daughter down. I liked how this book had everything I expected but done in a way that caught me off guard. The Captain's Daughter gets 4 Stars from me. 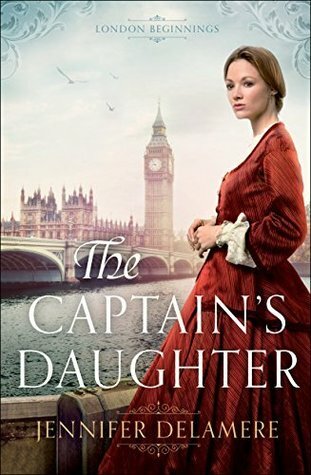 Have you read The Captain's Daughter? What did you think? Let me know!